Think you know everything there is to know about Magic Kingdom? You just might, but chances are there is an experience or two that has slipped through the cracks, going unnoticed by many first-time visitors and even sometimes self-proclaimed Disney fanatics. Some of these experiences are more obscure than others, but none of them are secrets. They are simply those delightfully magical experiences that Disney masters so well, waiting to be discovered and enjoyed by all! You probably have a barber shop in your home town and you may even have one on Main Street, but unless you are at the Harmony Barber Shop on Magic Kingdom’s Main Street, USA your haircut won’t even come close to being as magical. If you time it right, the Dapper Dans might even serenade you while you get your new “do.” Some may think this place is a kid’s only experience, but that couldn’t be farther from the truth. Come inside and get a little snip-snipping. There is no age limit on the haircuts they provide, and even adults can get in on that sprinkling of magical pixie dust too. There is an opening ceremony at this delightful hot dog eatery located on the end corner of Main Street, U.S.A. Just before the official opening, the doors swing open and the Cast Members randomly select a child to “throw the first pitch.” They then break out into the familiar song, “Take Me Out to the Ballgame,” encouraging everyone to join in. Complimentary bags of Cracker Jacks are then handed to several lucky guests! Since this experience only happens once per day, many, who aren’t privy to it ahead of time, miss out on this fun! Also fun at Casey’s Corner is the ragtime piano delights of Disney Jim, the master pianist who has been tickling the ivories outside of this restaurant for over 30 years. He performs for 20-minute durations several times a day, and watching him do his thing has become a tradition for many long time Disney goers. Don’t miss a chance to watch him work his musical magic on this piano—it is a true gem of a Disney experience! We get it—you didn’t come to the Magic Kingdom to kick back and get some shut-eye. But sometimes, especially if you are “one-day-ing” it and spending hour upon hour zipping around the park from one attraction to the next, you need to take a small break. The newly completed hub area and the bright green patches of silky soft grass not far from the front of Cinderella Castle is a perfect place to take a load off your feet. I’ve enjoyed this space with my family, giving my toddler a chance to stretch his legs outside of his stroller and chase the ducks. I’ve seen people lying on blankets relaxing (and sleeping). I’ve witnessed families sitting and enjoying a home-brought picnic lunch. The best part is I’ve never seen this place overwhelmingly crowded with people—in fact, I’ve even enjoyed this area smack dab in the middle of the afternoon without another soul taking up realty. Perhaps some people think this area is off-limits because of how picture perfect pristine it is but the truth of the matter is that anyone can frolic around this grassy courtyard until their heart’s content. It doesn’t get much better than stretching out here and gazing at the majestic Cinderella Castle, and is perfect for photo opportunities with it as the backdrop. Beginning about 20 minutes prior to “rope-drop,” guests waiting to enter the Magic Kingdom will be treated to an opening ceremony including Disney characters, dancers, Main Street Citizens and a randomly selected family who arrive at the train station (via the Magic Kingdom Railroad train of course) to welcome everyone and ceremoniously open the gates. 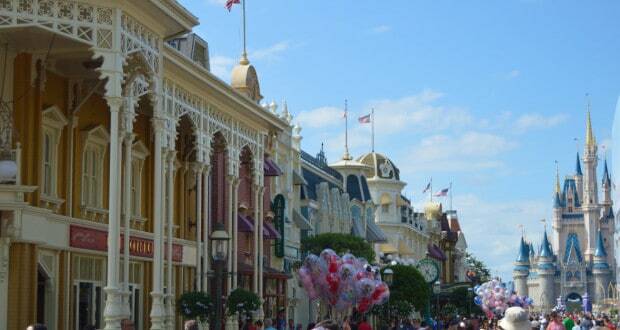 It is a delightful way to begin your Magic Kingdom day! Another experience that often gets missed by those who head out early is “The Kiss Goodnight.” Cinderella Castle sends off guests with a display of bright colors and lights. This special tribute, performed nightly roughly 30 minutes after the official park closing, begins with the nostalgic “When You Wish upon a Star” as colorful hues are cast upon the Castle with twinkling sound effects. Soon, a narrator comes over the loudspeaker, reminding us all what the Magic Kingdom is all about and why we love this happy place! You don’t have to go to Bippidi Boppidi Boutique or the Harmony Barber Shop to get pixie dusted. You can simply pop on into Castle Couture, a gift shop located just behind Cinderella Castle, and get a complimentary sprinkling, no matter your age! The Cast Members here come equipped with a wand of this fairy dust and are happy to shake a little glittery happiness on top of the head of anyone who asks. It’s colorful and sparkly (and it might just stay in your hair even after a wash or two). This experience is sure to add a smile to your little ones face (or yours, because who doesn’t want to add a little pixie-dusted magic to their day?!). Who wouldn’t love to participate in a flash-mob style dance party with Disney characters? Taking place daily, this interactive guest experience features the lovable Country Bears and other delightful characters and Cast Members who fill the streets and encourage guests to join in on country line-dancing and square-dancing. The official times aren’t published on the Disney website, so it’s always best to ask a Frontierland Cast Member when to expect this upbeat and delightful experience. The Frontierland Hoedown takes place outside the Country Bear Jamboree, Prairie Outpost & Supply and Pecos Bill’s Tall Tale Inn & Café. This legendary and incredibly talented 12-piece brass and percussion marching band which appears on Main Street several times a day is certain to impress with their performances of classic Disney film tunes as well as other familiar songs infused with ragtime and swing. They are out for 20-minute durations, marching from Town Square and moving throughout Main Street, and usually come out during the mid-morning hours. I stumbled upon this delightful experience by happenstance, and was intrigued and mesmerized by the unique and precise skills of the artisans manipulating glass with fire. During select times at the back of the Arribas Brothers shop (i.e. “Crystal Arts”) on Main Street, guests can watch as artisans use air to mold and form glass, intriguing us all in their exacted art as they make wine goblets, Christmas bulbs, vases, or something of the like. The entire demonstration lasts about 15 minutes. If you don’t happen to catch the glass-blowing demonstration, you still might get an opportunity to witness a skilled artisan at the front of the store who sits at a station equipped with a flame torch, using the fire’s heat to manipulate glass objects (which can be purchased in the same store). The glass blowing demonstration times are not advertised on the Disney website, but can be found posted daily in the store itself. It’s only appropriate that at the Magic Kingdom where princes and princesses reside you get a chance to learn how to act like true royalty. At the Castle Courtyard in Fantasyland, the Royal Majesty Makers (Sir Sterling and Lady Llewellyn) appear several times a day to entertain guests and show “little lords and ladies” the secrets to “royaldom.” These ambassadors and official consultants of Cinderella’s Court are ready to engage villagers with lessons in royal dancing, swordsmanship (slaying invisible dragons! ), and horse riding. Check the Magic Kingdom’s Times Guide for official appearance times. Another chance to boogie on down with Disney characters is in Tomorrowland at the #INCREDIBLESSuperDanceParty where you can bop around with the likes of the daring Mr. and Mrs. Incredible and Frozone as they weave into the streets. The times vary when they will appear, but typically takes place intermittently throughout the evening hours. When Mr. Spin, the dynamic D.J., starts spinning the beats, the dancers begin hitting the streets! It’s easy to miss these folks, especially if you are rushing down Main Street to get to your prized attractions. The next time you visit Magic Kingdom, however, take your time strolling down Main Street and you might have the delightful opportunity of bumping into a Main Street “Citizen” who will entertain you with stories in their 19th Century garb, and sometimes even sing to you. The cast of characters vary, but among these friendly folks you might find the Etiquette Columnist for the Main St. Gazette, Francis Fermata, the Chief of the Main Street Fire Department, Smokey Miller, and the President of the Main St. Social Society, Mabel Mae Benaught. I assure you, you won’t regret taking the time to chat up these wonderfully authentic characters. Ring, ring, ring goes the trolley! Performing a few times each morning on Main Street, a trolley arrives and entertainers pour out onto the streets to sing and dance in a smile-inducing show. Because the routine is a short one and it only happens a few times each morning, it’s easy to miss this experience! Check the official times guide on the Disney World Website so you don’t miss out on this magical performance! These guys are a hoot, and can be found performing daily at Frontierland intermittingly throughout each day. This trio performs songs on their old-time country instruments (a set of banjos and a tuba), encouraging guests to join in with song and dance. They are humorous fellows, guaranteed to pull some giggles out of you as they tell jokes, share one-liners, and belt out some ole west classics and Disney tunes. This is a surefire opportunity to experience that Disney magic as they LOVE mingling with the crowd and will interact with you and your children as you join in on their fun act. This is one of those Disney experiences that I always try to catch, and it never fails to be a tearjerker for me. Each day at 5p.m. at Magic Kingdom’s Square, there is a flag retreat ceremony to honor our nation and those who defend it in the most selfless way. A veteran is randomly selected each day to participate in the ceremony, and will receive a special certificate, photo, and pin to commemorate their experience. Don’t miss out on this opportunity to pledge allegiance to our nation and hear patriotic songs as our flag is lowered and folded in this special ceremony.